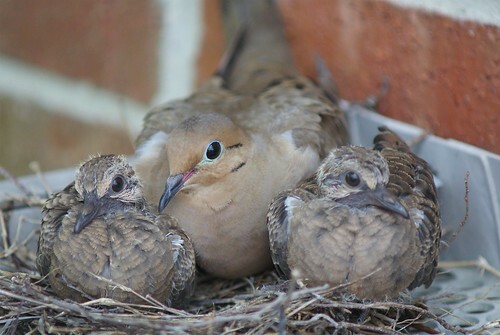 Yesterday I came home to find that Momma Dove was off shopping for bugs or worms or whatever it is baby birds eat. That gave me a great chance to get close for this photo. Today I found that Momma was back, and positioned as if for a family portrait. When she’s around, I can’t get too close, so I have to stand back, hold the camera over my head with the viewscreen extended, and try to frame a decent shot. That can be hard when it’s sunny like today, because the viewscreen isn’t bright enough to compete with full daylight. Today I found her back in place more or less on top of them again. But note how the feathers are really filling out on the chicks. Soon they’ll be fledging. 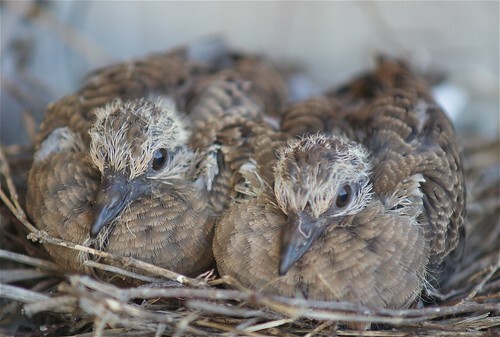 I hope I can be there to see them leave the nest… but the odds are against it. I’m just afraid she and her chicks might not last long. They’re only about 4 feet off the ground – easily within cat range. I know it seems like I have forgotten my blog because I’m not writing in it any more. This neglect is not intentional; I have just not felt like writing. It’s been this way pretty much since Ike. I’ll get over it. In the mean time, I do realize that this blog is now beginning its fifth year, and so something must be posted. But since I don’t feel like writing, I’ll let others speak for me. Here are some nice quotes about horses, beginning with one I have posted here before. These quotes were gathered from here and here. Watch it. You’ll like it. 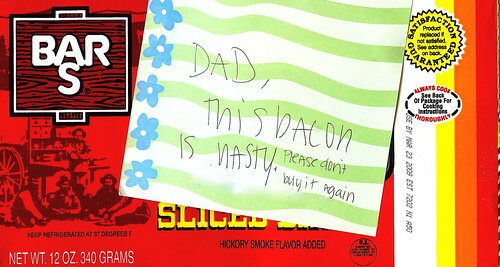 Gleefully stolen from Justin’s blog. jimthompson.org is powered by WordPress | 21 queries. 0.170 seconds.